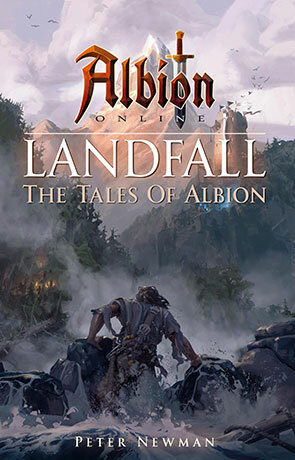 Fresh from the publication of The Vagrant and all worthy plaudits assigned to this, Peter Newman’s next book, set in the world of the Albion Online MMORPG is a very different affair. We follow the trials and tribulations of Tia, her daughters and her crew as they first arrive in Albion, having had their ship, the Sturdy Girl shot out from under them by an unprovoked attack by Augustus Cornell, a retired military officer, leading another expedition to the new land. As with all stories, there are detailed reasons behind the conflict and competing agendas at work. Newman quickly sketches a diverse cast of characters from both ships as they struggle to adapt in their new world. Unfortunately, it is the world that is the primary weakness of the story, which is strange, as usually this would be the main selling point of a multiplayer computer game. Newman’s description is thin and barely rises from the generic at times. Comparisons to The Vagrant leave Landfall lacking by quite a margin. It is possible that players of Albion Online would fill in these details for themselves, but this limits the potential audience substantially. The best tie-in fiction becomes an avenue to the franchise and certainly writers like Michael A. Stackpole and Timothy Zahn demonstrate how this can be done. Newman’s writing of action is also lacking evocation. There are many ‘attacks’, not charges, thrusts, lunges, stabs, etc, which is surprising considering the vivid portrayal of both location and events in his previous work. Genericism also permeates the development of the story. Too much emphasis is placed on the things game players value from their game playing experience, with detail on other parts that a reader would expect to see, sorely lacking. This leaves the characters as the most memorable element of the work and at times you see flashes of Newman’s brilliance in their dialogue and interplay. Tia is particularly well drawn. Randall and William Augustus Cornell begin with some similarities, but quickly branch apart. Angry John also develops nicely, with a vomit filled altercation being especially memorable. Newman demonstrates he’s comfortable with consequences for his characters, with some injured, maimed and possessed because of their experiences, but their isn’t the same level of grit and reflection you’d expect to accompany good contemporary writing that explores such adversity. Instead, we have a cartoonlike context where damaged folk quickly become accustomed to their new limitations. At times there’s a lack of blood too, which serves to make the circumstance less meaningful overall. Looking at the proposed aesthetic of the computer game, perhaps this is all part of the intention? Landfall is certainly a pacey read and will appeal to those interested in expanding the world of the computer game Albion Online. The slightly sanitised tone may appeal to a Young Adult reader. For those curious about Peter Newman’s work, a better start might be The Vagrant and its sequel The Malice. Written on 2nd April 2016 by Allen Stroud.